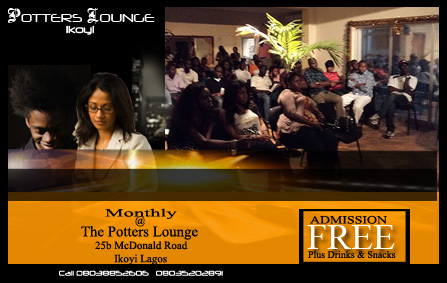 Finally You can now mark your calendar for Saturday, the 29th of October 2011 for the most explosive Potters Lounge so far. The potters lounge is more than a place. It is a platform, a center in Ikoyi where the best minds converge . It’s an exciting place where young people come together monthly to hang out with our society’s core successful professionals through the interactive platform. This edition holds a lot of surprises. The Potters Lounge is in line with our vision to guide and raise the next generation of success stories that will deliver professional excellence in their fields of endeavor while building a world with value. This is a nonprofit initiative which Farafina is happy to partner with. It is free, with refreshments, materials, fun and intellectual contents under a relaxed atmosphere. It promises to feature a challenging yet inspiring and interactive talk on issues of our times ranging from career, business, leadership, values, relationship, emotions, 360 degrees knowledge, skills juggled with book and business reviews, crash MBA classes and platforms for networking while having fun and adding value under the ambiance of soothing music. The Commonwealth Foundation has made the call for entries for the new Commonwealth Book Prize and Commonwealth Short Story Prize. The prizes are part of a new initiative, Commonwealth Writers, an online hub to inspire, inform and create a community of writers from all over the world. Together with the prizes, Commonwealth Writers unearths, develops and promotes the best new fiction from across the Commonwealth. Awarded for best first book, the Commonwealth Book Prize is open to writers who have had their first novel (full length work of fiction) published between 1 January and 31 December 2011. Regional winners receive £2,500 and the overall winner receives £10,000. The Commonwealth Short Story Prize is awarded for the best piece of unpublished short fiction (2000-5000 words). Regional winners receive £1,000 and the overall winner receives £5,000. The winners will be announced in June 2012. Visit here for eligibility and entry rules. 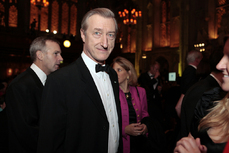 Julian Barnes was yesterday October 18, 2011 named winner of the 2011 Man Booker Prize by Dame Stella Rimington, Chair of the 2011 judges, for his book ‘The Sense of an Ending’. The announcement was made at the awards dinner at London’s Guildhall with a presentation of a cheque for £50,000 by Jon Aisbitt, Chairman of Man. Barnes’ first novel for six years, The Sense of an Ending went straight into the bestseller list on publication. It is the story of a seemingly ordinary man who, when revisiting his past in later life, discovers that the memories he holds are less than perfect. Barnes,the bookmakers’ favorite said he was “as much relieved as I am delighted” to win the £50,000 prize. Should Farafina be afraid of Amazon.com? ” Amazon.com has taught readers that they do not need bookstores. Now it is encouraging writers to cast aside their publishers….It has set up a flagship line run by a publishing veteran, Laurence Kirshbaum, to bring out brand-name fiction and nonfiction. “Publishers say Amazon is aggressively wooing some of their top authors. And the company is gnawing away at the services that publishers, critics and agents used to provide…. “Publishers are terrified and don’t know what to do,” said Dennis Loy Johnson of Melville House, who is known for speaking his mind. Do you think publishers, especially in Nigeria, should be worried about this? Leave us a comment! Swedish poet Tomas Gösta Transtromer has emerged winner of the 2011 Nobel Prize for Literature. Winner of the £942,000 prize (largest in the world of books), Transtromer has again brought Sweden to literary limelight as the last Swede to win the literature Nobel was in 1974, when Swedish authors Eyvind Johnson and Harry Martinson took the prize jointly. Born on April 15, 1931 in Stockholm, Tomas Gösta Tranströmer was raised alone by his mother after she divorced his father- a journalist. He received a degree in psychology from Stockholm University and later divided his time between poetry and his work as a psychologist working with the disabled, convicts and drug addicts while, at the same time, producing a large body of poetic work. Peter Englund, permanent secretary of the Nobel committee said Transtromer’s work was chosen “because, through his condensed, translucent images, he gives us fresh access to reality” he also said and “you can never feel small after reading the poetry of Tomas Tranströmer – he’s also exquisite when it comes to language”. In Sweden he has been called a ‘buzzard poet’ because his haunting, visionary poetry shows the world from a height, in a mystic dimension, but brings every detail of the natural world into sharp focus. His poems are often explorations of the borderland between sleep and waking, between the conscious and unconscious states. Transtromer’s most famous works include the 1966 “Windows and Stones,” in which he depicts themes from his many travels and “Baltics” from 1974.
one of them utterly dark, where enemies live. Lamps are burning in the other. The well-lit shore hypnotizes the dark shore.